Unless your dentist advises you to follow a different schedule, you should plan to attend regular dental exams semiannually. 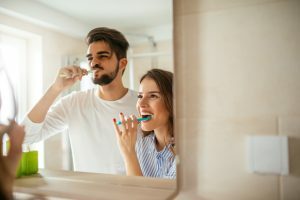 These six-month checkups give you important information on the state of your dental well-being, and they involve a careful professional cleaning. Of course, even though they certainly help, they are not all you need to do to keep your smile in great shape. Your daily decisions can influence how likely you are to experience a cavity, or to develop gum disease. Following smart, smile-friendly behaviors means thoroughly brushing and flossing on a routine basis. It also means paying attention to your diet, and cutting back on products that are more likely to create trouble for your teeth. You can protect yourself against gathering oral bacteria and food debris through thoroughly brushing and flossing. You should brush your teeth at least twice each day, and take care to reach every area possible. By flossing daily, you can make sure those spaces between teeth, which a brush can fail to reach, are properly treated. Removing oral bacteria will protect your teeth, and keeping the base of your teeth clean can help you avoid an accumulation of harmful bacteria that might cause gum disease. If you cut back on sticky, sugary foods that are so readily available at meals and snacks, you can cut back on the risks that your smile can face. Oral bacteria can feed on sugar, and the digestive process releases the harmful acids that can create cavities. While smart oral care can help, a poor diet can expose your teeth to more risk, and more problems. At Santa Monica Dental Arts, patients can look forward to dedicated dental care. While Dr. Koshki is ready to help you deal with problems that affect the health and look of your smile, our practice can also welcome you for important preventive exams and cleanings. To learn more about the services we can provide, or to schedule your consultation with Dr. Moeiz Koshki, call Santa Monica Dental Arts in Santa Monica, CA today at 310-395-1261.